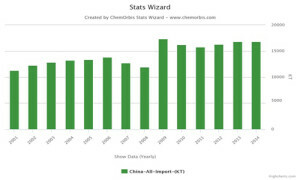 According to ChemOrbis daily headline, in line with the arrival of the latest statistics revealed for December, overall import data for the year 2014 was completed for China and Turkey. China’s polymer imports almost caught the record broken in 2013, lagging only around 40,000 tons behind the previous year. Turkey’s overall imports, meanwhile, fell behind 2013’s record by only 2% in 2014. Both countries’ overall import volumes managed to remain close to the all time high import levels achieved in 2013 despite the fact that crude oil prices sustained a downward path in the second half of 2014 and polymer prices steadily retreated beginning from the August-September period in both regions. China, the world’s largest polymer importer, continued to add new capacities of PP and PE in 2014, which resulted in a slower rate of growth for these products. Overall homo PP imports were up only by 2% in 2014 on a yearly basis while copolymer imports were mostly unchanged. LLDPE imports rose by around 4-5% year over year whereas HDPE imports even retreated by 2-3%. On the other hand, LDPE imports were comparatively much higher as they posted a yearly increase of 19%. This was attributed to the start-up of coal based capacities across China, which mostly produce homo PP, HDPE and LLDPE out of coal to olefin technology. 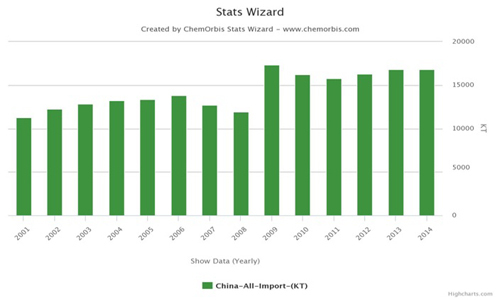 China’s overall PS imports were down considerably by 31% in 2014, which players are attributing to the fact that converters are switching to PP or PET for packaging applications. PVC imports retreated in 2014 too, falling by 10-11% year over year with the country continuing to reduce its dependency on imports thanks to its growing domestic capacity. When it comes to Turkey, the yearly increase of homo PP imports almost compensated the yearly losses of other products in the overall polymer imports. Homo PP imports reached an all time high in 2014 in Turkey, almost nearing the 1.5 million threshold. Overall LLDPE imports were almost flat from 2013 as they posted a yearly decrease of less than 1% in 2014. Apart from these two products, all other products recorded decreases on a yearly basis. LDPE imports saw a minor decline of 1% despite the shutdown at Petkim’s cracker and downstream LDPE units. HDPE imports were also down by 2.5% year over year. Turkey’s PVC imports slumped by 5% and PS imports lost ground by 6% in 2014 with respect to 2013, according to ChemOrbis. The most considerable decrease was seen in PET bottle imports with 61% due to the start-up of the new plant of Koksan in late 2013 on top of the other two domestic producers. Overall ABS imports were unchanged, meanwhile.